Kleenite® is 3X More Powerful than Tablets. It is a Fast, Safe and Effective retainer cleaner… Kills 99.9% of odor causing bacteria for fresher breath. 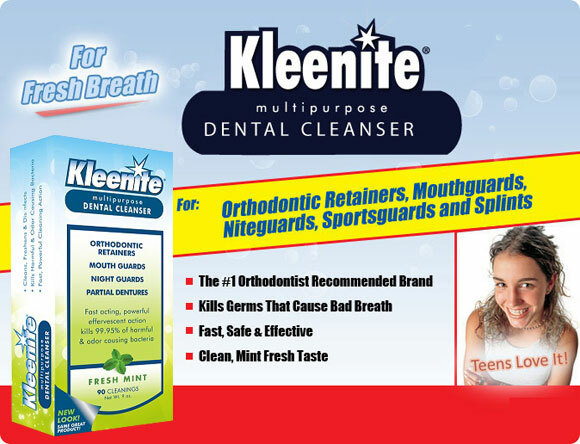 Kleenite® is the #1 brand recommended by thousands of orthodontists…. many of whom have sent us testimonial comments. Kleenite® is a superior retainer cleaner that is safe for all types of orthodontic retainers including clear Essix retainers and clear invisalign-type aligners. Do not risk brushing clear appliances with toothpastes which may make them opaque and dull. Kleenite® is a multipurpose orthodontic cleaner that is best for cleaning retainers, mouthguards, nightguards, sportsguards, flexible partials like Flexite® and Valplast®, and invisible aligners. Amazon.com, American Associated Pharmacies (AAP), Bed & Bath, BiMart, Bartell, Discount Drug, Family Pharmacy, Health Mart, Leader Drug, MediChest.com, MyOTC.com, Save Mart, ShopRite, Value Rite, Wakefern.